This eCommerce SEO checklist gives you the most important factors for better SERP ranking. Items include page title, headers, URLs, link and video optimization through content strategy, frontend performance and structured data formats. And last but least make sure your webshop is secure with HTTPS to avoid SEO penalty. If you take away only one tip: make sure that your title tags and h1 tags are optimized for SEO. The title tag is what is being shown in the search results and is what is given most weight. Make the title tag specific. Have your keywords in the beginning of the tag. Also make sure to repeat the title tag text as the main header on your product page. In addition you should repeat the main keywords throughout the product description text. Consider the 700c white tires from classic bicycles manufacturer Skiens Cykkelfabrik. The URLs of your product pages should be in natural text and reflecting the main keywords of your product page. The URLs should match the title and header tags. Natural text URLs are good for ecommerce SEO but also for usability of course. Keep your meta descriptions up to date. This is the text that is shown under the page title in the search results. Keep it accurate and selling. This is both a factor for ecommerce SEO but also to make sure your customers click on your link when it appears in the search. A big chunk of the searches done by shoppers are via image search. You should of course use great photos. But for SEO you also need to make sure that you use a good filename and alt text as this is being used by Google when indexing photos. 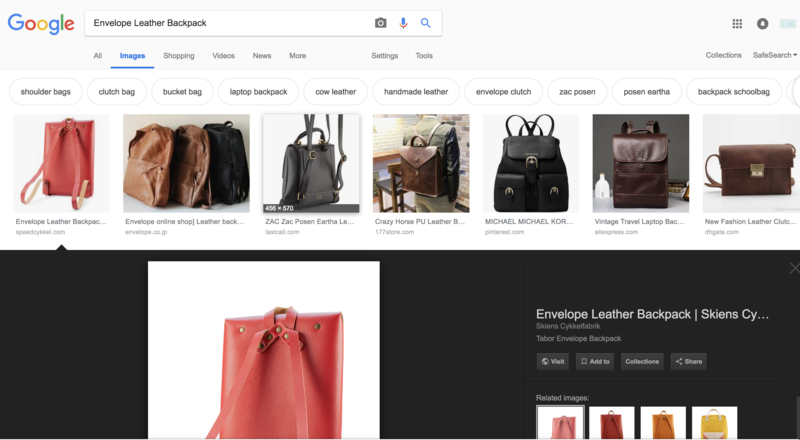 Consider the envelope leather backpack in the search below. A great photo and ranked number one in the image search. For videos you need to make sure the filenames are containing the top keywords, same as with images. But more importantly use structured data formats to properly index videos in Google. You should consider if you are using YouTube for videos or serving them natively. Do not have the same videos on both YouTube and your site natively as this will make them compete, and YouTube will most likely win. Make sure you are getting as many high quality external links as possible. This builds page and domain authority and is ultimately giving you an edge over your competitors. But perhaps even more powerful is the text that is being linked. This gives semantic meaning to the link and is good for accessibility and usability. But it is also giving the destination page a boost for the linked keywords. Of course the linked destination page should repeat the linked keywords. No cheating. Customers are being influenced by product reviews. If you have product reviews on your site make sure that you show them in the search results. If you add reviews to your structured data it will show nicely in Google and customers can make more informed decisions. Like this highly rated kollagen product from MyRevolution. When running an ecommerce shop today you also need to run a media company. You need to consistently produce engaging rich content for ecommerce. Content and commerce are merging and customers expect rich detailed information about your products. To support your content marketing efforts you should establish a content calendar and commit to producing high quality relevant content for your customers. Be strategic in your approach to topics and optimize your content for the most relevant keywords. Google is checking mobile friendliness. It impacts ranking. Make sure your pages are mobile friendly. You can easily test if your pages are mobile friendly. Use structured data for your different types of content. Products, videos, blog posts or even job postings should use structured data. The web is getting more semantic as we are targeting more channels like voice and visual search. You can test your structured data with Google. Structured data will show reviews, price and stock information directly in the search results for products. This also boost click rates as the customers are better informed already from the search result page. Fast ecommerce sites are getting better ranking. Make sure you have optimized your webshop for frontend performance. Use pagespeed insight from Google to check your webshop performance. Continuously monitor and optimize your webshop performance. When running a webshop you need to take performance seriously as it affects SEO. You need to ensure that your backend is not slowing you down. If you use a headless PIM for your eCommerce API make sure it is fast and scalable. Make sure you only have one URL to your pages. Set up redirects from http to https. Redirect www subdomains to the main URL. Also make sure you have a canonical tag on your page in case you have multiple URLs to the same page. It is best practice and Google checks. Make sure you have permanent redirects of old URLs. Proper HTTP 301 header information should be sent. This will inform Google that the page has permanently moved and will update its index. Browsers are automatically redirected when they hit a HTTP 301 redirect header so customers will also find the new page automatically. This is more of a housekeeping point, but do not forget to make your site secure with HTTPS. HTTPS is Faster than HTTP so it is good for user experience, but more importantly for SEO Google is giving a penalty if you are not using HTTPS.